The artistry of pianist/composer Mark Hayes is magnificently on display in this extraordinary collection of Christmas carols and its companion listening CD available separately (see item 99/2023L). Eighteen carols, old and new, are creatively explored in these fifteen handsome settings, with some titles emanating from the chants of the early church and some from the newer classics of today. 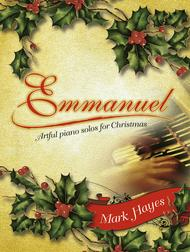 All are afforded the unmistakable creative touch of Mark Hayes, and all are suitable for the concert stage or seasonal worship services. Whether you are playing or listening, these carol settings will enhance the joyful and tender moments of the Christmas season. The best arrangement of Christmas songs I've played! I was able to sightread these songs fairly well, finding some areas more challenging. Very beautifully arranged, they do indeed sound "artful", and the book lays flat. , which many of these are. My favorites in the book: Emmanuel Comes; Bring a Torch; and Still, Still, Still. I liked 6 more, for a total of 9 of 15. Mark Hayes employs some of the most satisfying harmonies and progressions to refresh familiar melodies. Moderately difficult arrangements very much worth learning and keeping in one's repertoire, perfect for sacred or secular settings alike. Incredibly good investment. 54 of 74 people found this review helpful.